For quite some time now I’ve sidestepped the idea of home ownership, and going into real estate in general. Owning land and house seems to be to go-to solution for a lot of people, especially when it comes to long-term plans like retirement. Majority of the people I spoke with about the subject encouraged me to “buy now!” My dad was a was a land surveyor, so I was exposed to property ownership at a very young age. But unlike my siblings, it’s something that never really appealed to me. I prefer to live a stressful and simple life. I like the idea of having a home, a place to go home to after a hard day’s work to unwind. I lived in four different countries all my life, but each move has always been dictated by a real personal need or practical reason. I still prefer to live somewhere long-term. Moving is a stressful process, and I would rather minimize it if I can help it. How much space does a single human being really need to live comfortably? Property ownership, in a traditional sense, to me is the epitome of string attachment. I don’t get the motivation of some people who amass so many properties or live in mansions, material things they can’t take to their graves. Do a person really need that much space? My father owned a huge house, he’s intent was to stick it to his naysayers that just because he doesn’t like to wear flashy clothes doesn’t mean he’s impoverished. Well, that was a very expensive offensive. At least he managed to enjoyed it for a few years. Our eldest also followed suit, size-wise, and built a big house – for a family of three. I simply don’t get it – why box in so much air in concrete? Owning a huge place mean its’ upkeep will be costly. Sure, some people can afford it, but is it really good for the earth? And for what, pride and ego? Is pleasing other people really the priority of living one’s life? When it comes to home ownership, I had a few choices: a detached house, a duplex, a townhouse, and a condo. I didn’t include “trailer” because it doesn’t appeal to me. A detached house is quite expensive in Vancouver, BC, you’ll have to live hours away from the city to be able to afford one, and I prefer to live in the outskirts but still close to the city, so that’s not an option. A duplex and townhouse, for practical reasons, are also out of the question. I just don’t want to live my life riddled with debt. So I’m left with … condos. Even though condominium is well within my range, it is very unappealing. Strata restrictions, endless renovation horror stories, the lack of a private yard, and being crammed in a complex with hundreds of other people sounds very suffocating. It’s basically a cookie-cutter kind of living from the outside. More so, I just don’t like the idea of having to constantly pay so much for something I already own. I’ve been told to sell a condo after five years of living in it – because the building renovation fees will be steep – well, I don’t want to do that. It almost sounds like a racket. I’ve mentioned to my friends on numerous occasions that I wouldn’t mind living in a small house as long as it’s detached. On my trip to Las Vegas a couple of weeks ago, I happen to strike a conversation with a cab driver. It was the only cab I took on that whole trip. She is a middle-aged woman who is close to retirement. She’s been a cab driver for over thirty years. We where talking about living in this modern world, about taking care of one’s self, about making frequent short vacations instead of long ones, and retirement. She mentioned that before she retires, she and her husband will sell their house in Las Vegas and buy a tiny house. She said a lot of people are doing it because it requires little effort to maintain and is very practical. She said it’s gaining a lot of popularity in the US, even in Nevada, as well as in Canada. I pinned that conversation in my “Check Later” memory, and we said our goodbyes. Then I happen to watch this short documentary “TINY : A Story About Living Small” on Netflix. It reminded me of my conversation with the cab driver. “This is what she’s talking about!” I said to myself. Then it all clicked! I don’t need a condo … THIS, this is what I need! No strata fees, no pesky pigeon house, no huge dwelling to maintain … just a modest place to call “home.” A small detached house, this is it! Do I really care about resale value? I care about living my life now and not what the future holds for me. My co-worker worked like a horse all his life, caring for his old folks, and wrestling with all sorts of agents while dealing with estate matters, he literally worked himself to death. He passed away from stress-related ailments just a few months away from retirement. It happened so quick me and my co-workers where in disbelief. He didn’t even get to really enjoy the fruits of his labor, never get to retire even. Live your life now, not tomorrow – “live your life now” also means “don’t live your life recklessly.” I care more about the value a dwelling and the quality of life it can bring to my life now and not its resale value. 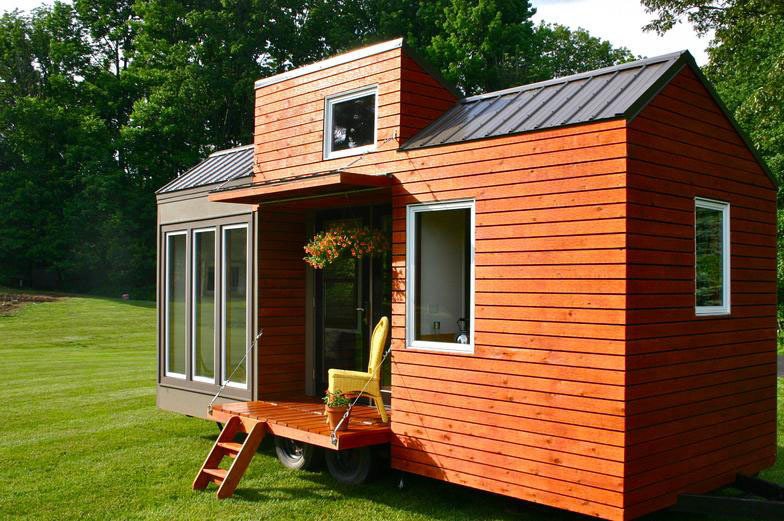 A tiny house, below 160 square-foot, would be fun. I like puzzles, stacking things, Lego, and Tetris, so optimizing a tiny space would be second-nature to me. I’ve lived in small quarters in my late teens to early twenties, so the environment would be familiar to me. Oh, and I do like to optimize shelves and corners, I think it’s going to be fun. All I need to do now is wait for a while to get my finances in order, but in the mean time, I’m going to look around at tiny houses in Vancouver. The documentary featured people living in tiny houses in Oregon and Washington State, that’s cool. Though, if I finally decide to do this, unlike the guy in the documentary, I’m not going to build it myself. Buying and renovating would be something I’d do. And I’d like something a little bit more modern, and not something that looks like the witch’s house in “Hansel and Gretel.” So we’ll see in a year or so where this talk will take me.